24 frames per second has long been regarded as the de facto standard frame rate to transfer productions to film. Comparatively, shooting video in 30p mode retains a more cinematic-like appearance but can introduce judder on image movement, which is often undesirable. Hence, when you use your Canon, Sony camera to shot in 30p but fail to smooth playback on multimedia players, what would you do? Maybe converting 30p footage to 24p is your best bet. Here are some tips & tricks to help you drop frame from 30p to 24p easy as ABC. To easily convert 30p to 24p with no jerkiness, finding a user-friendly yet solid frame rate converter is the master key. Among the plethora of frame rate converting tools, the highly acclaimed MacX Video Converter Pro stands out from the crowd to aid you convert clips from 30p to 24p with High Quality Engine and De-interlacing tech to guarantee the smooth yet sharp video image from ghosting. Built-in various parameter settings, you can not only adjust frame rate 29.97 to 23.97, convert 60p to 24p, but also customize Bit rate, video resolution (2160p, 1080p, 720p), aspect ratio (4:3 to 16:9 or vice versa) etc to specialize your video files. Beyond converting video frame rate from 30p to 24p or 60p to 24p, this versatile video converter software also works seamlessly as a video transcoder, video downloader, on-screen recorder, slideshow maker, ringtone maker, etc., letting you convert videos to MP4 MKV AVI MOV, etc. 180+ video and 14+ audio formats, free download videos from YouTube, Vimeo, etc. 300+ sites and record on-screen gameplay video, etc. Tips for your later shooting: During production, if you are sure you don't want to do slow motion, set your shutter speed manually to 1/50 or 1/40, which will greatly smooth the footage when converting to 24p. 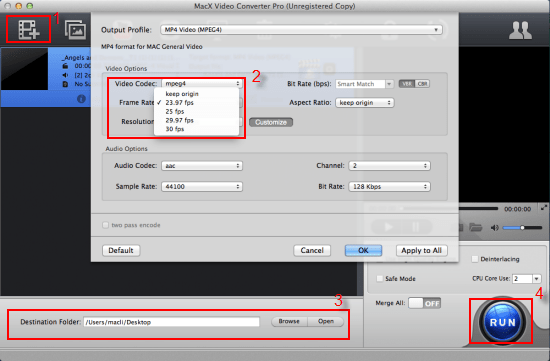 How to Trouble-free Convert 30p to 24p Without Choppy Playback? As the award-winning frame rate converter, what this all-round video converter can do is far from your imagination. It can also convert among SD and HD videos, including AVCHD to MP4, MTS to MOV, MKV to AVI, FLV to MP4, etc. Plus, it works as the strong downloader & converter for YouTube, screen video recorder, Mac video editing software and slideshow maker, etc. Step 1: Free download frame rate converter for Windows version or Mac OS version, fire it up and then import the footage you want to convert from 30p to 24p. Step 3: Click "Browse" button to pick out the place to store your output clips on computer. Step 4: Press "RUN" and this frame rate converter will begin to convert frame rate 30p to 24p. The whole process just costs a few mins and then you will get the 24p footage for smooth playback. Part 2: How About Converting 30p to 24p with Slow Motion? Different videos call for different effects. When you want to show the details in the 30p clip that happens during a short period of time, you'll need to convert 30p to 24p with the slow motion effect. 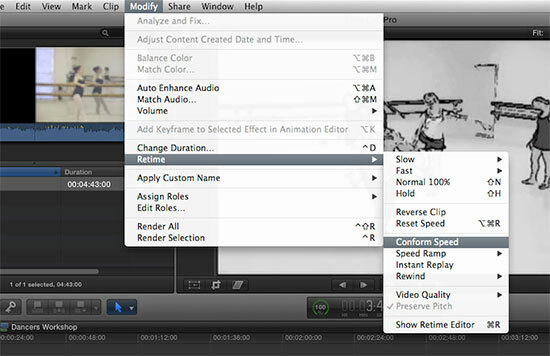 Here below is the ultimate solution to drop frame from 30p to 24p with slow motion by using the common Final Cut Pro. Final Cut Pro is a non-linear video editing software which provides non-destructive editing of loads of video formats. If you are running FCP on your Mac computer, it's dead-easy for you to convert 30p to 24p with slow motion. And providing you are the FCP X user, you just need two steps (select your clip in the timeline > Modify > Retime > Conform Speed) and then your 30p to 24p conversion with slow motion is successfully completed. The whole 30p to 24p conversion for FCP 7 needs 4 steps only: import the 30p footage from your computer > Press "View" button and choose "Open in Cinema Tools" > Click "Conform Clip" button on the lower right corner of the preview window and begin to lower 30p to 24p > Double hits the video icon and you can see the clip frame rate has already changed to 24p with slow motion effect. Beyond the above solutions to convert 30p to 24p with slow motion or not, here exists one more way to convert clips from 30p to 24p. That is slowing down the playback rate by 0.800, up to 25% slow down. In this way, there is no jerkiness, and everything gets a smooth, dreamy look, which is very cinematic. It's mentionable that this method takes out the ability of shooting short movies where people have to talk on camera since you can’t resample audio with the same effectiveness as you do for video, but it's sound for everything else.